Let’s say it’s January 2016, and you’re the head of marketing in the Mountain Dew division of PepsiCo. You’re making a commercial to air during the upcoming Super Bowl 50. Each 30-second spot costs $5 million. 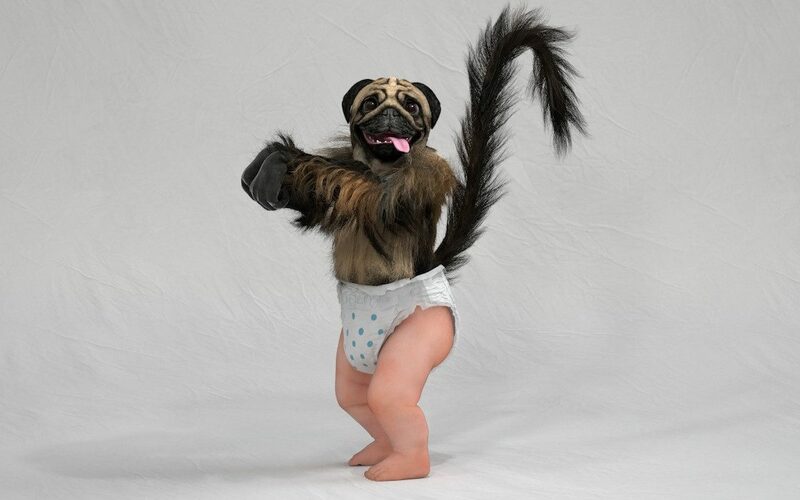 Your go-to advertising firm – the massive BBDO in NYC – comes to you with the idea of broadcasting a new mascot that’s a Frankensteinian combination of a pug’s head, a monkey’s torso, and a baby’s stubby legs, called (pause for effect) Puppy Monkey Baby. How do you respond? Whether you proceed to green-light the campaign or write a one-star Yelp review for BBDO probably depends on which school of thought you subscribe to with regard to the role of humor in advertising. On one hand, you may side with some of the forefathers of modern marketing, who argue, “people do not buy from clowns;” that advertisers should take after two of the most influential books ever – the Bible and the Sears Catalog – in their utter omission of comedy. Or, you may be swayed by the modern advertising behemoths that swear by humor’s ability to drive sales. Today, almost a quarter of primetime television advertisements are intended to be funny, and solid evidence says humor both attracts attention and enhances likability. So what’s the deal with airline food comedy in advertising? Will it grow your brand’s favorability or tank its legitimacy? The answer isn’t black and white – it comes down to a host of factors, including your message, your audience, and, well, your humor. Of course, attention and likeability are valuable things for an ad to evoke, but if your campaign aims to drive sales in the short-term, it isn’t necessarily enough to be funny. It’s not the humor that calls the consumer to action – it’s the message. Crafting humor that bolsters, rather than replaces, said message is the sweetspot of comical advertising. Humor’s ability to grab attention is well documented. However, that can be a double-edged sword. Think, for example, of Puppy Monkey Baby. Odds are, you recognized that creature (perhaps from your recurrent nightmares) when I mentioned it, but could you have recalled it was the concoction of the folks at Mountain Dew? I had to look it up. Therein lies the “vampire effect,” which occurs when the consumer’s attention is sucked away, by one factor or another, from the most crucial piece of the ad – the brand itself. The vampire effect underscores the importance of keeping humor on message, of not letting the intermediary goal of getting a laugh detract from the superordinate goal of growing the brand. Think of your favorite funny ad campaign in recent memory. Perhaps it’s the “Mac vs. PC” series, so liberally sprinkled with the phrase “I’m a Mac” and traditional Apple design. Or maybe it’s Old Spice’s recent onslaught, featuring overt branding and product placement that gives new meaning to the word “satire.” And who could forget the work of GEICO, whose many series, as random as they seem, share templates that make them unmistakably GEICO. What these textbook campaigns share (aside from copious funding, which helps, no doubt) is that they make it nearly impossible for the consumer to remember the commercial but forget the brand from which it came. Vampire effect averted. Laughter engenders a powerful connection between buyer and brand, but the difficulty of achieving it is proportional to the value of the payoff. To take a blank page and turn it into laughter is easier said than done, and it’s even harder when you’re shackled by the need to keep from overshadowing the message and brand. Plus, everyone’s idea of humor is different. What might be 100%, definitely, for-sure funny to you is essentially guaranteed to strike someone else’s unfunny bone…or worse, offend them. That’s a thin line to toe, especially since failed attempts at humor often garner particular dislike. In light of these risks and rewards, you, as the PepsiCo marketing executive, might be on the fence about approving BBDO’s outlandish Puppy Monkey Baby idea. Well, let me fast forward for you. Spoiler alert – you went with the ad. Good news: your sales spiked 34% after Super Bowl 50. Bad news: countless articles and comments have been written about the atrocity that is Puppy Monkey Baby. Convenient news: you’ve created a perfect example for me to point out both the risk and upside associated with humorous campaigns. So, no, humor is not a silver bullet guaranteeing sales growth. But it’s also not the poison to your company’s legitimacy that it was once made out to be. Like any marketing strategy, it comes with upsides and drawbacks, and knowing how it works is crucial to knowing when it should be used. On the plus side, it grabs viewers’ attention and increases their favorability towards your brand. Millions of YouTubers – the same people you could hardly pay to sit through most advertisements – go out of their way to watch funny ads online, which is invaluable free exposure. On the downside, humor is hard. It’s tricky to make people laugh and near impossible to make everyone laugh at the same thing. Even if you succeed in that regard, you risk detracting from the core message and informational content of your advertisement, which are the real sales drivers. Plus, there are more questions to be considered: does your brand have a personality that would mesh well with humor? Do the products/services offered target an audience that would be receptive to humor? While most of the research into humor’s role in advertising (including this post) revolves around television commercials, the general principles discovered can be extended to other channels. Whether you’re making a $5-million Super Bowl spot or drafting a tweet, keep humor tucked in your utility belt as a potent – yet tricky to wield – means of grabbing the public’s attention and making people like your brand. Featured image by Ron White.